Have you ever looked at Abe Lincoln’s face? I mean really looked at it. For the man who held our nation’s highest office during one of the toughest parts of our collective past, the word “weathered” just doesn’t cut it. His face is worn and stretched thin across hollow cheeks. It’s the face of resolute exhaustion. It’s also a face that I 3D printed. That last bit is pretty important and – I think – going to change how we educate. How might that observation: “the face of exhaustion”, change how students view that president, his sacrifice, and his role in our nation’s history? 3D printing has been around for a while (think 1980s) and using it in schools is becoming more standardized. That’s generally taken the form of working 3D into Science, Technology, Engineering, Art, and Math classes (hint: that spells STEAM). Limiting 3D printers to STEAM classes feels a bit like saying we should only use computers for computer science. The truth is that computers do more than compute. They offer dynamic ways for us to see and hear about things much too far away for a field trip. They bring us media from around the world which frames whatever’s being taught in a more specific context. Computers give students a touchpoint for what might otherwise just seem too removed to relate to. The problem is you can’t actually touch digital content. There’s always some part of us that isn’t satisfied with just looking and listening. We live in a physical world. We want to know how something feels. Enter 3D printing. This technology brings the digital world back into the one we live in. Sound abstract? An example then. The Smithsonian Institute has a massive collection of objects that are relevant to a wide variety of social studies and history classes. 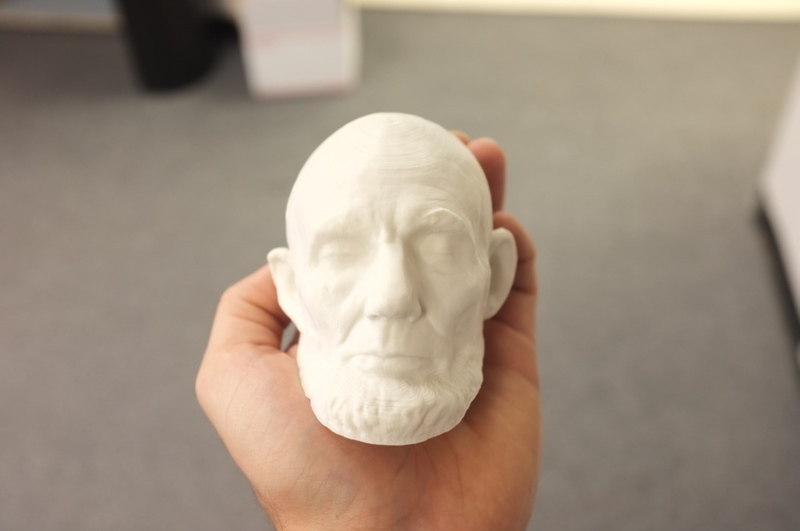 Remember that 3D print of Honest Abe that I started with? This is how I was able to get my hands on it. Normally if you wanted to see this particular life mask you would have to make the trip to The National Portrait Gallery. With the Smithsonian X 3D program though, anyone with the inclination and access to a 3D printer can produce their own life mask with just a few clicks. Stop and think for a moment, how many artifacts, fossils, or buildings are out there in the world that might help our students better understand key subjects? Now we have the ability to put those objects right in their hands. Making “teachable objects” like these is the next step towards integrating 3D printing into our schools. They bring our classrooms to new a level – the physical – and that’s a step in the right direction.